As one of the more controversial topics in diagnostics today, reproductive genetic testing (RGT) has become a lightning rod for political rhetoric and a font of misconception within the general populace. Science fiction would have us believe that RGT will be used to make designer super babies that are disease free and have perfect features. However, the current medical reality is seemingly more pragmatic by typically assisting couples with reproductive difficulties obtain genetic screening and counseling during in vitro fertilization (IVF) procedures, as well as help all future parents eliminate the risk of common inherited genetic abnormalities. Traditional genetic screening techniques have relied on observation methods using either customary histology stains (G-banding stain) for gross chromosomal analysis or the use of specific fluorescent markers (FISH analysis) that hybridize within chromosomes that are common for aneuploidy—defined as an abnormal number of chromosomes within the cell. The advantage of these techniques is their speed, low cost, and validated methods for determining genetic abnormalities. However, to obtain the genetic material often requires the use of invasive techniques that carry some risk for the developing fetus. Rapid progress in genomic medicine over the past several years has allowed researchers to detect and diagnose discreet genetic abnormalities within a clinical setting. 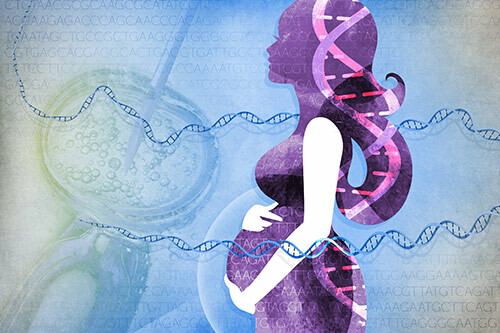 Prenatal genetic screening is a field where this is becoming a mainstay of clinical medicine. Women are routinely administered a variety of genetic screening tests within the first trimester in order to detect chromosomal aneuploidies, as well as other inherited abnormalities. Many of these tests come in the form of ultrasonograms or they use maternal serum markers, which typically suffer from high false positive rates. Positive tests for fetal abnormalities will often lead to much more invasive methods like chorionic villus sampling (CVS) or amniocentesis. However, many women are uncomfortable with the idea of such invasive procedures, as they carry a 1-2% risk of inducing a miscarriage. However, many companies and institutions have been developing new screening methods that are more accurate and carry much less risk.